I was thumbing through some CDs when this cover caught my eye. I started thinking, "Who did this already?" The Rolling Stones with "Sticky Fingers?" Motley Crue, "Too Fast For Love?" Loverboy's "Get Lucky?" That's the one! Except Loverboy did the crossed fingers in conjunction with the album title. Plus, back then, it was red leather; now it's denim and the universal hand sign for rock (or metal horns as I like to call them (\m/)). But I digress. Despite the band's moniker, this is not death metal by any means so if you buy it before reading this award-craving review then shame on you. The music that these two guys create is more along the lines of parody rock but with some cool guitar and unique vocals. Every now and then you think a Rolling Stones or Led Zeppelin song is going to emerge but it comes back to reality and you get some interesting music instead. Queens Of The Stone Age have their fans and I'm not sure how many took the avenue left turn that Joshua "Baby Duck" Homme decided to but if you want a side project that has his name on it, pick up this garage rock CD. 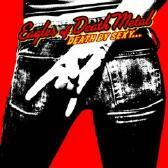 Eagles Of Death Metal: Two guys with a lot of studio time. For more information, check out http://www.eaglesofdeathmetal.com. I don't know this for a fact, but I have to believe that Josh Homme does Eagles of Death Metal purely for the fun of it. If you attempt to take this record seriously, it can be considered nothing but a miserable failure. If you listen to it just for the fun of it, however, it's a truly entertaining experience. Groovy, psychedelic guitars, falsetto vocals (but no yodeling a la The Darkness), dis-syncopated rhythms (Mr. SOS's comparison to Devo, below, is well-founded), and silly lyrics and song titles ("Cherry Cola" is even more ridiculous than Warrant's "Cherry Pie"), all combine to create a very different listening experience. It's not Queens of the Stone Age, it's certainly not the titular death metal, it's just novelty rock'n'roll. And, as that, it will do what it sets out to do: Put a smile on your face. Eagles of Death Metal: Jesse "Boots Electric" Hughes and Joshua "Baby Duck" Homme. 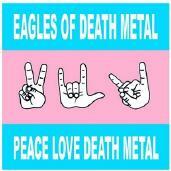 For more information, check out http://www.eaglesofdeathmetal.net. Eagles of Death Metal is yet another side project from Queens of the Stone Age mainman Josh Homme, but instead of hearing Homme's swirling guitar and laid back vocals, we are instead treated to his percussive abilities on this meandering 15-track endeavor. The trio, rounded out by some of Homme's longtime drinking buddies, play the kind of quirky '80s induced robotic punk rock that you'd find on a Devo album, sans the charm. A falsetto voice armed with lewd lyrics and primitive riffs is basically what Eagles of Death Metal provide, and while it's not the worst thing in the world (and obviously very misleading if you're looking for a death metal album), we all know that Homme can do way better than this exercise in self-indulgence. If you're looking for musical brilliance, listen to "Songs For the Deaf" again, but definitely skip right past this disc.